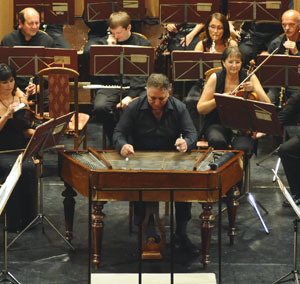 Mozart, Liszt or Gershwin for symphony orchestra and Hungarian cimbalom (hammer dulcimer)? 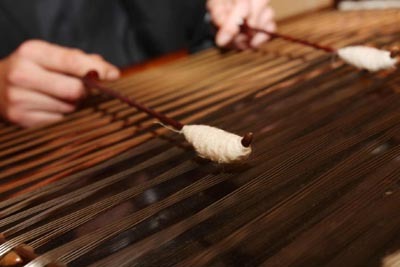 Outside Hungary it sounds unusual to include a typical Hungarian folk instrument, the cimbalom to perform with a symphony orchestra, but in Hungary the beauty of this instrumental combination has been known since the 19th century. Join us for an unforgettable musical travel á la hongroise through the most beautiful classical melodies ever. The Danube Symphony Orchestra was formed in 1961. Since then they have given many performances both in Hungary and abroad. The Chamber Orchestra consists of 20 professional musicians. They have had international contacts since 1983 and have been invited to play in many foreign countries. They have often accompanied solo artists at music competitions and participated in colourful operettas, ballets and oratorio performances as well. Not only do the musicians work together in this orchestra but in several chamber orchestras as well. Besides their permanent conductor András Deák, they are often conducted by other Hungarian and foreign conductors. Many Hungarian and foreign guest artists have performed with the orchestra, including Giuseppe di Stefano from Italy, James Galway, a flautist from Ireland and Ray Charles, the jazz star from the USA. They have given performances in Germany, France, Switzerland, the Netherlands and Italy. The program of the concert and the orchestra is expanded with a world-known typical Hungarian instrument Cimbalom (concert hammer dulcimer). This instrument is played primarily with beaters. It is equipped with a heavy frame for more dynamic power and added many strings courses for an extended range of sounds and a damper pedal to allow more dynamic control. Their permanent concert hall is the theatre of the Danube Palace. The Danube Palace, formerly the Casino of Lipótváros was established in 1883. It was founded by Miksa Falk, who was also its first president. The construction of the casino was completed in 1895, based on the plans of Vilmos Freund. Géza Márkus was the architect of the casino. 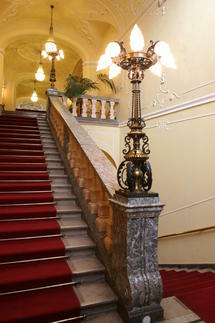 The external facade is made by Mészáros and Gerstenberger and the architectural style of the building is neobaroque. The murals on the walls of the theatre were painted by Lajos Márk. Since its openingthe Casinohas excelled at patronising the arts: exhibitions and concerts have been held here, it has financed opera performances and it has also organised competitions. A great many famous people have given performances in the Casino such as Béla Bartók, Zoltán Kodály, Mark Twain and Antonin Dvorak. Here is the Danube Palace on the map. Spend the first evening of the New Year with our chamber concert organised in the beautiful neobaroque theatre of the Danube Palace. You can listen to a special programme which was compiled just for this evening by the Danube Chamber Orchestra, including well-known and popular works of famous composers. The Chamber Concert starts at 17:30, and it is 70 minutes without intermission. If you book the program with pick-up service we would kindly ask you to fill the hotel name and telephone number fields on the ordering form, and at the day of the event please be at the reception of the hotel 40 minutes before the start of the program, and tell the receptionist that you are waiting for pick-up (taxi drivers usually ask them first). Before booking a program with pick-up service, please consider your hotel's distance from the venue of the program. 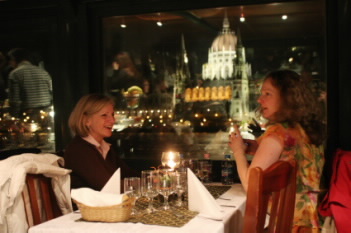 After our Danube Chamber Orchestra we would like to invite you to see the Budapest in the romantic atmosphere of a dinner by candlelight surrounded by the friendly lights of the Danube capital. 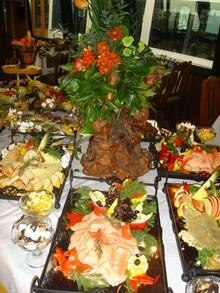 After the end of the performance in the Duna Palota (Danube Palace), our hostesses will accompany you to the Ship. You will be welcomed on board of one of our ships, which will take you on a one and a half hours long cruise with an excellent warm buffet-dinner. In the romantic candlelight atmosphere you can enjoy the wonderful view of the city swimming in light. After dinner you can also admire the panorama from the open upper deck of the ship.